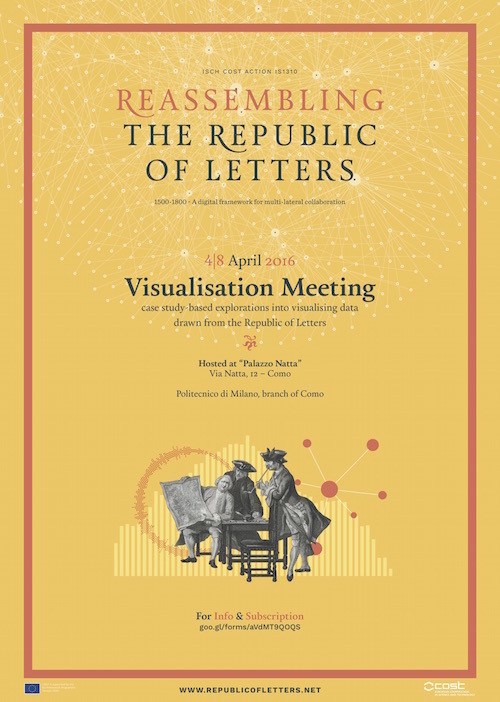 The goal of this Training School is to bring together humanists and designers and to see them working on a common task: a case study-based exploration into visualising structured or unstructured data drawn from the Republic of Letters. The Training School will help to unravel many technical doubts and outline good practices and strategies that are useful for designing better tools for digital humanities. The meeting is being coordinated by Paolo Ciuccarelli (WG6 leader) and Charles van den Heuvel (WG3 leader), with the support of DensityDesign Research Lab. If you’re interested in taking part in this Training School, please fill in the subscription form following this link. Deadline for subscription is 26th February 2016.